Fun Fact: In Chinese, the Great Wall of China is often referred to as “万里长城 (Wan Li Chang Cheng)” - i.e. the Long Wall of 10,000里 (one 里 is about 1/2 a km). In actuality, this is a massive undersell. The full length of the Great Wall, an ongoing project that’s continued for over 2000 years, is really over 20,000km, stretching from the North shore deep into Qinghai/Mongolia, and with inner and outer sections. And while some of those sections are “AAAAA” tourist sites packed to the gills every holiday with families shuffling as one giant mass of selfie fanatics, other parts are so empty you can regularly sneak up to camp on them. Which is exactly what I did this Mid-Autumn Festival with a group called Beijing Hikers. And it was fantastic. 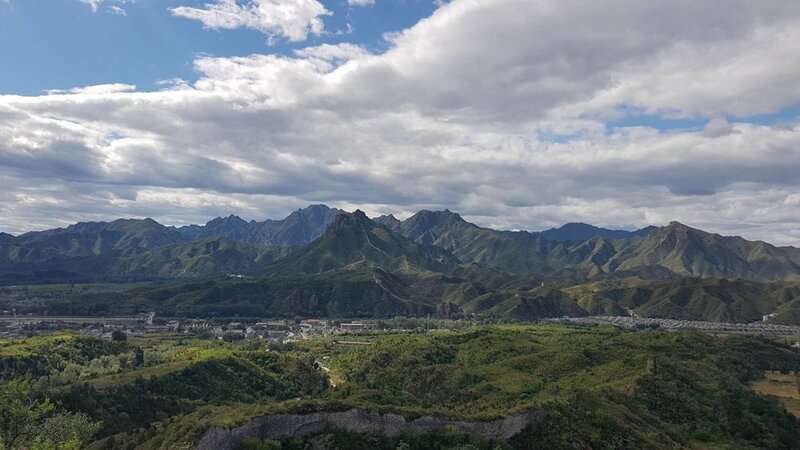 For those of you who want to get straight to booking it, you can find the hike I went on at this link on the Beijing Hikers website. They have a yearly membership in case you live in Beijing and like the idea of hiking many weekends out of the year. The cute hand-drawn map to give us a feel for what we’d be doing… before they took it away. We had a late morning start in Beijing and got to our first destination, Gubeikou, by around 1pm. In order to get us straight to the hiking portion, the organizers handed out lunch sandwiches about thirty minutes before we arrived at our destination. The twelve or so of us in this party quickly disembarked and within minutes we were on our first stretch of Wall. 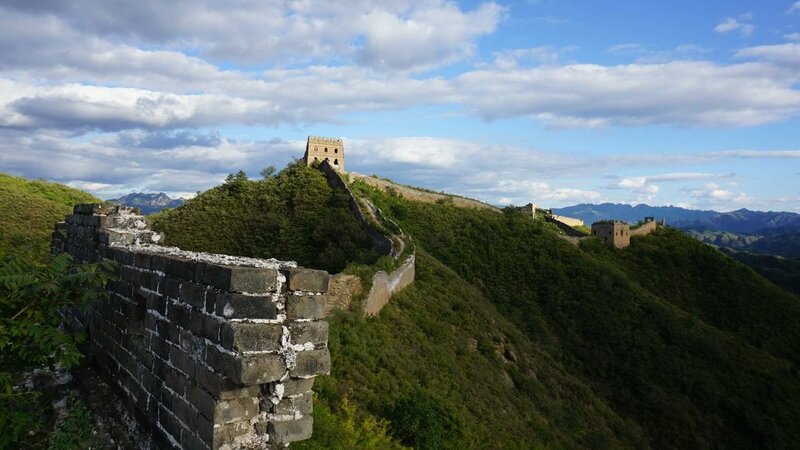 A warning or a recommendation (depending on your preference): The Wall of Gubeikou, located in Hebei Province, has not been repaired as much as the more popular, closer to Beijing city walls of Mutianyu or Badaling. You won’t find too many smooth black ramparts to peer around, as most of them have been dismantled by time and (most likely) villagers in need of bricks. 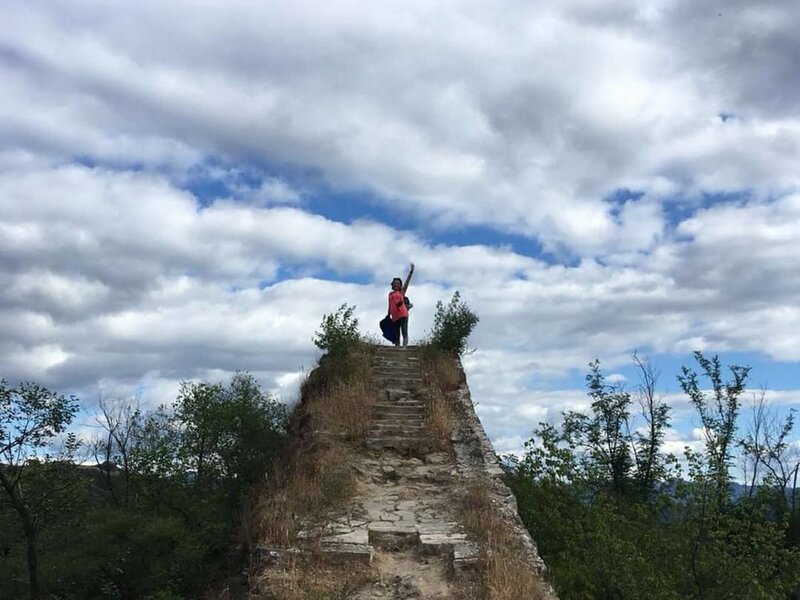 Instead, you get mountains filled with winding ruins, sentinels that seem precariously held together by iron stems, meter high steps that require actual clambering to get upon. And what a glorious day it was to clamber. Just four years ago, I would have never imagined that I’d be able to see skies as blue and as bright as the ones I saw this time. The North in Autumn 2018 has exceeded all my expectations of what air quality can be in China. Beijing Hikers rates this hike a difficulty level of 3, and expects it to take between 4 - 6 hours, depending on level of physical fitness. But I think they deliberately overestimate the difficulty in order to make sure everyone absolutely gets to the camp site before dark. When our group arrived at our stomping grounds for the night, a tower that still had a roof, it hadn’t even hit 4pm yet. As part of the arrangement with Beijing Hikers, you only need to bring your day pack with you. Tents, sleeping bags, cooking equipment and other heavy things are driven to a closer car park, and then brought up the side of the wall by local help. So by the time we arrived, our stuff for the night was already there. We did unpack and set it up ourselves though. By the way, ever tried putting up tents on solid rock when the wind picks up? It’s hilarious. To pass the time before sunset, we noodled our way over to the very end of the Gubeikou climb, a structure called the 24-Eye Tower. Situated on the peak of Panlong Shan, the tower is named such because of the 24 observation windows it housed - 6 on each side. It’s one of the few relatively intact towers left over from a Ming Dynasty wall expansion 800 years ago. And then there was not much left to do except conversation and star gazing. The moon was out in full brightness that night (the Mid-Autumn Festival is all about the Full Moon, after all), but even though it shone enough to make sure we were never “in the dark,” we could see the stars incredibly clearly. Thanks to one guy’s phone app, we could even identify which ones were planets - did you know you could actually, with the naked eye, see Saturn and Jupiter? I had no clue until they all appeared alongside Venus and Mars in a line tracing from the Moon to the horizon. One day I’ll get a camera powerful enough to take pictures of that scene - alas, all I could capture was this. But that’s the MOON providing all that light. It was brighter outside than it was where we had set up camp. Dinner, also provided by Beijing Hikers, consisted of instant noodles, breads, sausages cooked over a tiny charcoal bbq plate, some raw vegetables and snacks like nuts & chips. Breakfast, served around 6am, was leftovers from last night + some boiled eggs brought up by the locals. So, if good campground food matters to you, I’d recommend adding it to your pack - I kind of wish I had. One couple on our trip, a diplomat just arrived in China, brought a bottle of Great Wall wine (lol) and some Bourbon. They had the right idea. We were all packed up and ready to go by 7am, which is apparently when the Gubeikou Great Wall guards begin their patrol. Camping on the wall is apparently one of those “semi-legal” activities in China - it’s not technically allowed but currently, it’s not causing enough harm to need strict regulation… at least not on the Hebei side! Once we got to the Jinshanling Wall, though, hello again CCTV. But I’m getting ahead of myself. Yesterday, I mentioned we had gotten to the very end of the Gubeikou climb. That’s because, though the walls go on, those parts are either controlled by Military or not renovated enough to be “safe” (reports vary). So once we reached the 24-Eye Tower for the second time, we went down into the valley to hike a trail alongside the wall. It’s called Spider Valley, though luckily we never really came across any spiders. - just a creepy old shed, and a lot of underbrush. Wear long pants unless you like getting your ankles scratched up. While first day of hiking didn’t feel like a big deal at all to a person of marginal fitness like me, the second day was definitely much more of a challenge. Experienced hikers often claim that even “natural locations” in China tend to be paved over. As dilapidated as Gubeikou was, you could tell someone had been there within the last decade to pour enough concrete to create steps. In Spider Valley, lots of the trails were just steep slides around tree roots and rocks, and steep climbs up other hillsides of tree roots and rocks. Occasionally, we’d come across a new-looking wooden bridge across one particularly deep dip that would then be followed by a 50-degree scramble. I don’t have too many pictures from this area. I was too busy trying not to pass out from climbing it. The underbrush area of Spider Valley - before it got hard. About two hours later, we reached Jinshanling, a section of The Wall that’s back in the Beijing Municipality area, and therefore well attended with guards, cameras and vendors selling snacks. Jinshanling is also beautiful. 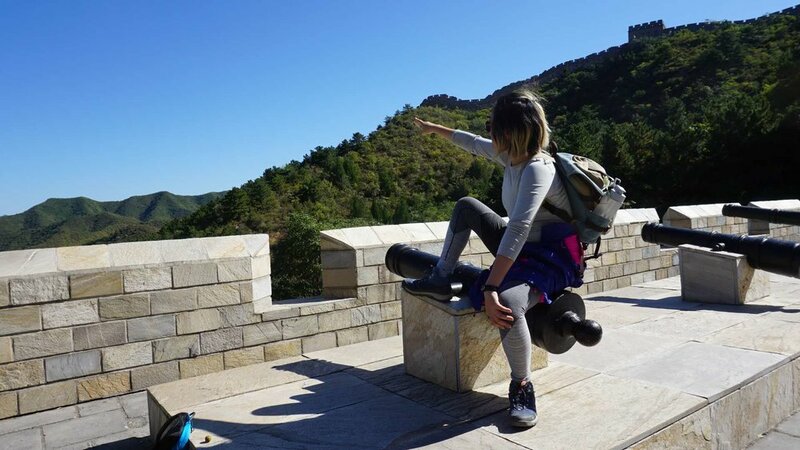 It seems like it’d be a great option for the whole family, especially if you want that Great Wall atmosphere without the Mutianyu/Badaling Great Wall crowds. The ancient structures have been renovated, which does intensify that feeling of grandeur looking up at them, and there’s helpful little QR codes next to various architectural elements to let you know what this hole or that pit was used for. Our guide said that the area is constantly hosting events - including a concert of 1000 Guzhen players (guzhen 古筝 is a type of piano/stringed instrument hybrid) situated along the entire wall, playing in unison. In fact, as we were leaving, they were setting cameras up for some show to celebrate the Mid-Autumn Festival. He’s like the Kool-Aid Man’s 500-year-old cousin who lifts. Admittedly, I was more drawn to the wild charm and complete lack of people in Gubeikou, but Jinshanling was a nice stop to end the trip on. If anything, it shows how far the Chinese tourism industry has matured over the years. Jinshanling’s roads were well-paved, its streetlights adorned by banners advertising the various highlights along the Wall, and there was Great Wall-themed folk songs being piped out of various speakers along the way. They even have a mascot that’s kind of cute. We didn’t really explore around there - we were due for lunch at a Nongjia restaurant on the way back into Beijing. And then we were dropped off in the same two places we were picked up - either the Lido Hotel or the Liangmaqiao Station - just in time to take a nap before dinner. 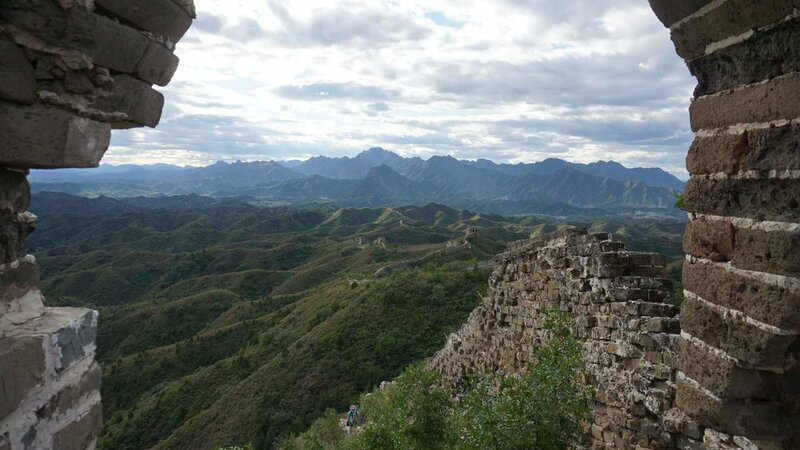 Overall, this trip was a great chance to check out less-traveled areas of The Great Wall without worrying about needing to bring more than a day pack. While I wasn’t always impressed by the food options, the guides were knowledgeable, the camping materials were all of good quality, and the schedule made sense. As an unexpected bonus, the weather and the air cooperated splendidly. Thanks Beijing Hikers for the amazing weekend!